Bicycling to any area of the UW-Milwaukee campus should be as simple and safe as possible for students, faculty, staff and visitors alike. Biking to campus is an affordable alternative to get to campus that is also great for your health and the environment. Whether you need air for your tires, would like to find the best route, or even if you’d like to understand more about bicycle planning at UWM, you will find many answers to your bicycling needs below. Ride in with the Chancellor! Rides will start from multiple locations ending in Spaights Plaza with a light breakfast, info booths, and a prize drawing. All rides will have a leader, leaving promptly at their designated time. Register for which location you’d like to meet up at and your name will be entered into a raffle drawing. Must be present to win. This one-time offer is available for UW-Milwaukee Faculty and Staff to utilize this spring. 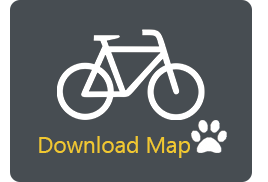 Sign up through the Bublr App or at their website with your UWM email and use the promotion code: UWMChallenge19. Many thanks to Bublr for sponsoring this special promotion! Department of Human Resources- Walk and Roll Challenge! The UWM Walk and Roll Challenge is a five week fitness challenge designed to promote wellbeing through physical activity. The Walk and Roll Challenge helps you understand and experience the health benefits of regular exercise. You can participate as a walker or a cyclist, either individually, or as a member of up to a three person team. Once you’ve finished the UWM Walk and Roll Challenge, sign up on the UWM team in this year’s annual UPAF Ride for the Arts. Select your preferable distance and register under the “UWM Panthers” team. This year’s UPAF ride is on Sunday June 2nd. UWM’s Bike Hub Study is endorsed by the Physical Environment Committee. See the report here. Bicycle Lockers Weather protected and secure lockers available through University Housing. Bicycle Racks Located throughout campus, most at major entrances to buildings. Air Filling Stations Available inside the Northwest Quadrant (NWQ) Garage, EMS Garage, Union Garage, and the Pavilion Garage. Bike Fix-it Station Located at Spaights Plaza, outside the Klotsche Pavilion (east side), and EMS building (southeast corner). Getting to and from campus with your bike does not necessarily require 100% pedal power. The Prowl Line and Milwaukee County Transit System buses are equipped with bike racks. Utilize these resources to shorten your bike commute to a manageable distance or when conditions reduce your safety. More information at MCTS page and Prowl Line page. Tune up your bike. Make sure it is in good working order. Find a good route. The route you take by car can not be the best route by bike. Wear a helmet. No trip is too short to not wear a helmet. Dress appropriately for conditions. Be visible and ready for the ride. Secure your bike The best way to store a bicycle on campus is to utilize University Housing’s bicycle lockers located at Sandburg Hall. The second best way to secure a bicycle on campus is to use a “U” lock. Learn the best ways to secure your bike with these tips from Bicycling Magazine. Register your bike It is optional to register a bicycle with the City of Milwaukee. Bike registration stickers can be picked up at any Milwaukee Public Library location, local Police Departments (including UWMPD), and UWM Transportation Services (Student Union WG25). Register online here. Please see Bicycle Registration for more details. What is an “abandoned” bike? 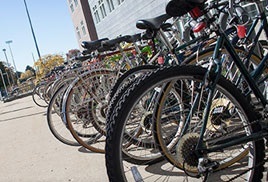 Bikes which are legally parked on all UWM property (Except for University Housing areas) are subject to removal if they meet the following criteria as abandoned. Criteria for assessing whether or not a bike is abandoned would have to meet two of these criteria. Impounded bicycles are held at UWM Surplus. After remaining unclaimed for 30 days, they are then made available for sale, scrap, or donation. UWM’s Bicycle Advisory Task Force, or BAT Force, was assembled as a cross—campus collaboration in the summer of 2012 in order to address making UWM a bicycle friendly campus. The efforts of the BAT Force recommendations have informed campus transportation planning, addressed UWM as a Best Place to Work, as well as simply making our existing and near future efforts more intentional and well communicated. Read the report. In 2018, UWM undertook at “Bike Hub Study” to build a better strategy for bike parking and campus connectivity. Read the report here. Augment our safe & secure campus with complete streets for all. Enhance the quality of life on campus. Attract students and employees to UWM. Reduce our environmental impact and fossil fuel consumption. Encourage health & wellness with our students, faculty, and staff.